Are you heartbroken by ignored messages? Lost in the job search sea? Get ready to be found by the ‘Tinder for Jobs’! Goodbye of the days of CVs, mind numbing forms and cover letters. Found is Sydney-based start-up, established in 2015, that is redefining hiring for the 21st century. 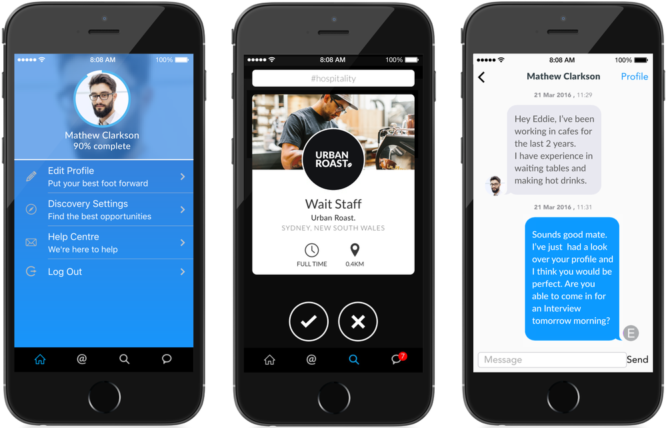 Dubbed the ‘tinder for jobs’, Found careers is a mobile solution that allows users to swipe right and find a job on their phones. All you need to do is download the app discover local jobs that you are interested in, build your profile once and apply with a simple tap and live happily ever after! 3D Printers doing awesome things. Want. A handbag that charges your phone on the go. Designing for short attention spa... oh look a cat! One.. two… three times a Column! Simon Google says… Mobile First!